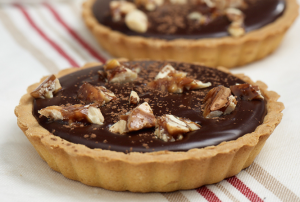 Miniature tarts made from crumbly and buttery crust with rich bittersweet chocolate filling and topped with with your favorite treats such as caramelized nuts, cocoa powder, dried fruits or candy sprinkles. Here's an easy dessert recipe for Bittersweet Chocolate Tartlets. In a bowl, combine the melted butter, sugar, vanilla, salt, and flour. Mix until just blended. The dough will be very soft and moist. Cool the tartlets on a wire rack. Once cooled, tartlets should be fairly easy to unmold. Sprinkle tartlets with toppings of your choice such as caramelized nuts, cocoa powder, dried fruits or candy sprinkles before serving.